We share the word of God through our music (southern gospel, bluegrass gospel, country gospel, traditional gospel and some contemporary). We are so thankful that God has blessed us with our music ministry and we will continue as long as He sees fit. The Lord brought the three of us together in 2011 to serve him in song. The songs we sing are our messages of faith. 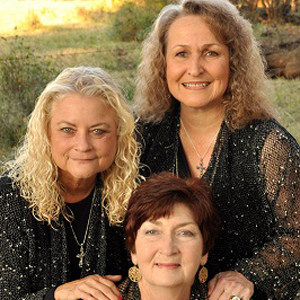 We are available for revivals, concerts, or any event to sing praises to God. We have received so many blessings through all the people we have met during our ministry and look forward to many more fellowship meetings. Jane and Susan lead the congregational music and with Yvonne as the pianist. Yvonne has a Masters in voice and piano, and has taught school and music for 40+ years. Yvonne and Susan are pianist at their individual churches. Jane serves on several committees in her church and ministers to all in need. Kim Riley is behind the scenes as sound technician, but is very instrumental to our ministry. Jane’s husband was pastor of each of their churches during his ministry.